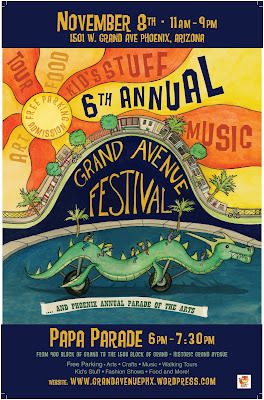 The last 2 weeks I've begun sculpting my Sea Monster for the Grand Avenue Festival in November. As you can see here I started with some balloons on the base. I began building the head in paper mache and building the first part of the body. Then I added details with paper compote. Once that dried (it only took 3 days), I sealed it with green paint, and will wrap it in plastic and set it aside while I work on the midsection (which I have only just begun). My goal is to have all three pieces of the monster sculpted and painted before we move to our new location in a few weeks. Then I'll do the finishing at our new place. 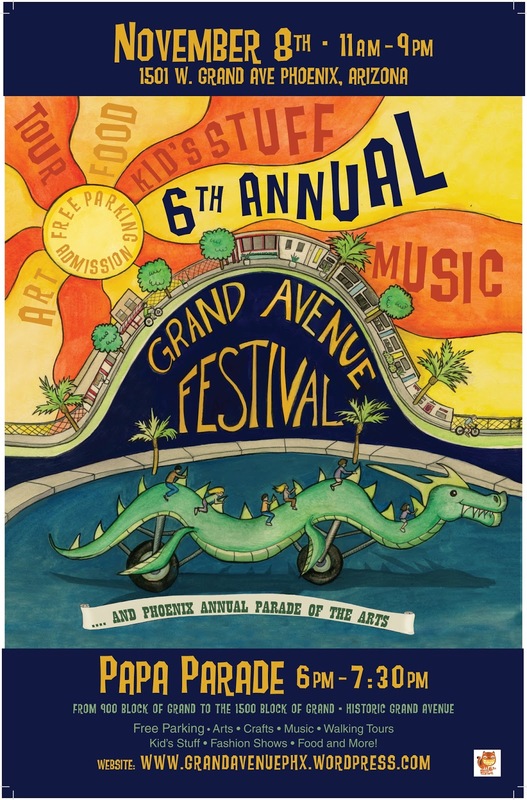 In the meantime graphic designer, Ishmael Dueñas, has been doing some incredible work on the poster design for the festival that I illustrated. This year's monsoon season has been pretty intense here in Phoenix. After the big storm 2 days ago traffic lights are down all around the city and so are a huge number of trees. This one is right next to our place. It's pretty impressive since it took down the bushes planted at the base. Anyway this week is all about getting ready for our move, and our trip over fall break-We're going to Mexico! ¡Hasta Luega!